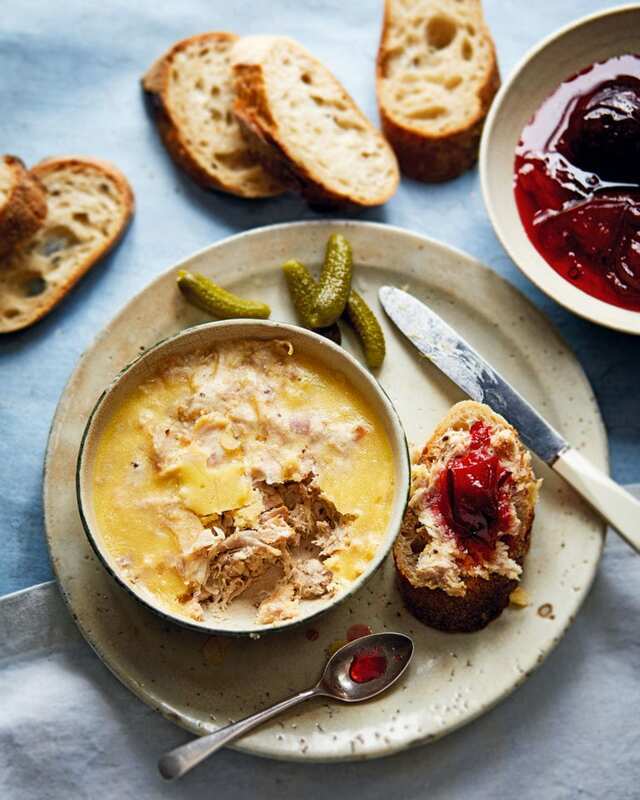 David Everitt-Matthias – head chef at Le Champignon Sauvage in Cheltenham – shares his recipe for a classic French delicacy: pork and rabbit rillettes seasoned with juniper berries, star anise and nutmeg. Serve with toasted sourdough for the perfect dinner party starter. Heat the oven to 140°C/120°C fan/gas 1. Cut the pork belly and back fat into 2cm pieces and put in a lidded casserole with the rabbit legs. Add the wine and just enough water to cover (about 200ml). Put the herbs in a muslin bag (or a piece of muslin tied with string) and push it under the rabbit legs. Add the juniper berries, star anise, garlic cloves and nutmeg. Cover the casserole and transfer to the oven. Cook for about 4 hours until the meat is very tender and falling off the bone. Check the casserole halfway through cooking and add more water if it’s looking dry. Once cooked, strain through a sieve and set the liquid aside. Pick the meat from the bones and shred the meat/ fat with 2 forks. Reserve the garlic and discard the other aromatics. Transfer the meat to a mixing bowl. Let the cooking liquid cool a little, then spoon the fat off the surface into a small bowl. Add 50ml of the cooking liquid and 30g of the fat to the meat mixture and stir in the mustard. Squeeze the garlic cloves out of their skins, stir into the mixture and season to taste. Push the mixture into the ramekins or terrines, pressing down firmly with the back of a spoon to remove any air pockets. Cool completely and chill. Spoon a little of the remaining fat over each (melt in a pan if it’s solidified – see tip) to form a seal. Serve with toasted sourdough, pickled damsons (or damson chutney) and cornichons. Pork back fat is available from peelham.co.uk, or ask your butcher. If there isn’t enough fat to cover all the ramekins, melt a little clarified butter instead. Once the fat has sealed the rillettes, they’ll keep in the fridge for up to 2 months.